Screw yard sales where strangers fondle my stuff and try to rip me off for my collector’s edition Six Million Dollar Man Bigfoot action figure. Or take a whiff of my old bowling shoes, turning away in disgust. I have a wife to give me those looks, thank you very much. Nope, I prefer to do this the new-fashioned way. It’s over 90 degrees here in the Big Rotten Apple, which gets me to thinking of books to bring to the beach. If you want to build your own beach read pile, I’m here to help. It’s time for a book sale! I have limited quantities of the titles above, along with a couple of others. 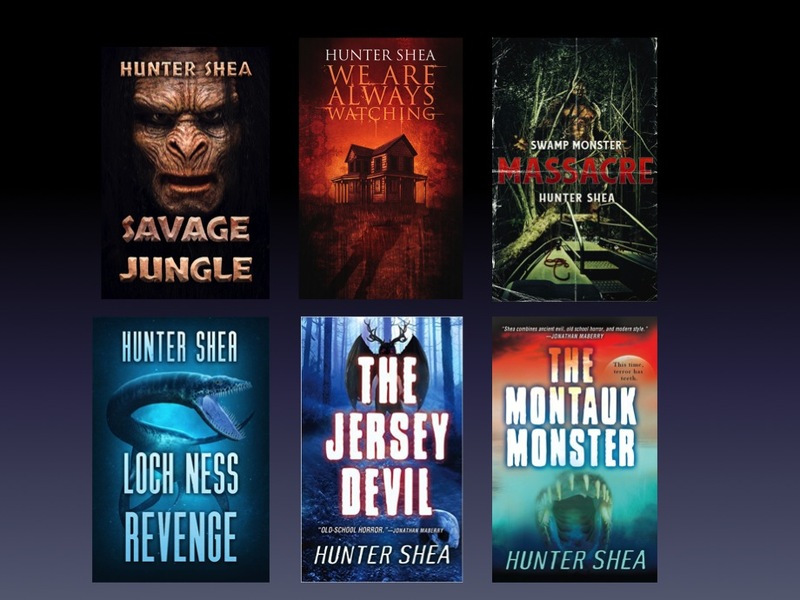 If you’d like one, or two or more, send an email to huntershea1@gmail.com with the titles you’d like and your address. Payments will be made via Paypal. All books will be personally made out to you so you can prove to everyone that you’re a true Hellion. You’ll also get bookmarks and I’m going to see if I have any official Hellion stickers in the mess I call an office. Be the coolest Mofo on the beach. Impress the ladies. Capture the man of your dreams. Read horror and grow rich! The prices below include shipping. Hi! I was curious if They Rise is about vampires? Thanks! It’s actually about prehistoric ghost sharks rising from the depths of the ocean. Hmm, maybe I need to write about vampire sharks next! Hey Kurt. Will do. All you need to do is go to Paypal and send $10 to huntershea1@gmail.com. Thanks! Ok i i will today.please include some bookmarks. Thank you.got the book today!